AGUILAR, Pangasinan — A 5.5 intensity tectonic earthquake jolted Pangasinan and neighboring provinces at 6:25 p.m. Wednesday. 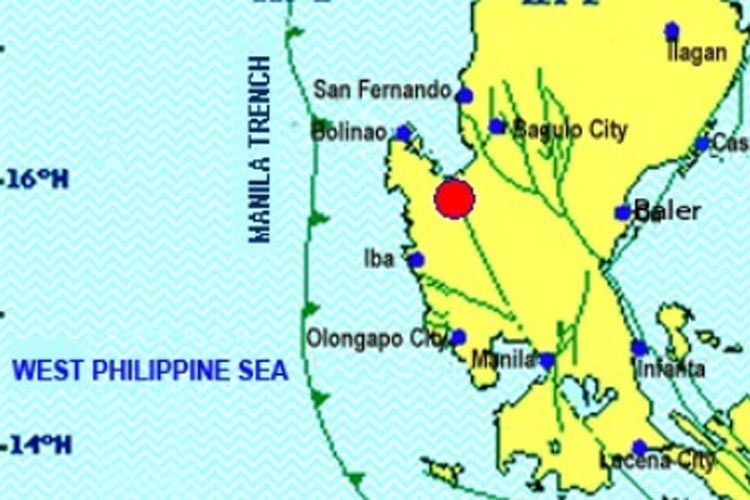 According to the Philippine Institute of Volcanology and Seismology (Phivolcs), the epicenter was located at this town, and an intensity 5 earthquake was monitored in Villasis Pangasinan; 4 in Baguio City; and 3 in Dagupan City, Pangasinan and Olongapo City, Zambales. A magnitude 2 quake also shook Subic, Zambales; Malolos, Bulacan; Guagua, Pampanga; Gapan City; Baguio City; Pasay City; Manila; and Quezon City. Argie Gattoc, training and information unit officer of the Pangasinan Provincial Disaster Risk Reduction and Management Office (PDRRMO), said the Municipal Disaster Risk Reduction and Management Offices (MDRRMO) of this town and other neighboring towns and cities, especially those in the coastal areas, are on standby alert for possible aftershocks or tsunami alert. “We are waiting for further information from Phivolcs for possible tsunami alert. So, we at PDRRMO and the local government units are on standby,” Gattoc said in an interview. He added there was no reported damage or injury so far, based on the initial assessment of the MDRRMO.